To The Batpoles! Batman 1966: #014 False Face: Best arc, or "a bomb"? #014 False Face: Best arc, or "a bomb"? 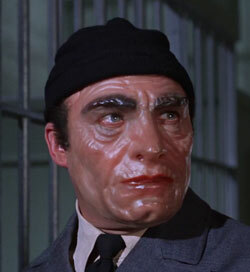 Malachi Throne's turn as False Face was one of the oddest villain appearances in the history of the show. Throne was only credited as "?" until the closing credits of part two -- why? Throne gave at least two different stories about this; which should we believe? While William Dozier thought the arc was a failure, and False Face never appeared again, some now regard this one as their favorite. Why? We discuss this question, as well as the mysterious cameo by two people on a subway, how TV False Face differed from False Face in the comics, reflections of '60s America in "Batman", and much more. There really was no women's lib in 1966 which you guys seem to be totally unaware of. Do your homework. You also seem to expect some kind of social relevance from this show. Beware of the Eisner book, it's loaded with errors.